It’s a cold winter night in 1917 in Petrograd, Russia… Problems with the supply of flour provoke fears of hunger in the city, as tensions begin to rise among the population… what would their Twitter look like if they could share their worries online? 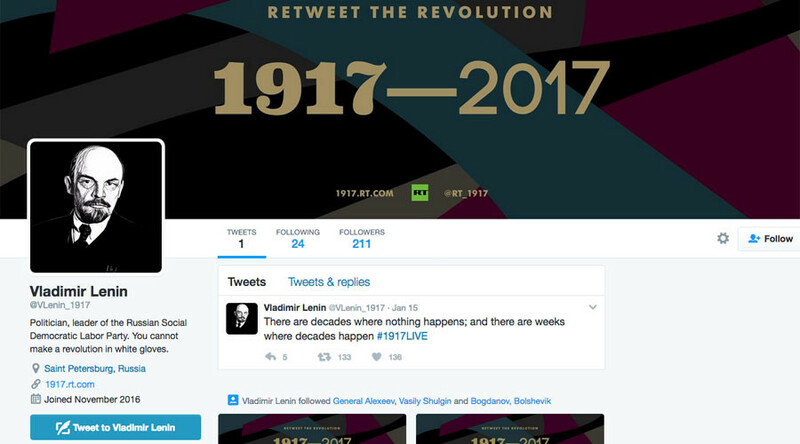 In a dynamic #1917LIVE project, RT lets you follow and even become part of a large-scale Twitter reenactment, guiding you through the twists and turns of the Russian revolution 100 years ago. The real-time tweeting will involve around 50 accounts of major historical figures like Nicholas II and Lenin, MPs, military officials, as well as average people witnessing the turbulent time. The personalities and all the tweets are based on real events and historical memoirs. The project is an attempt “to create the first-ever monumental social media drama/play,” and to get our international audience in touch with the 1917 Revolution, one of the turning points in the Russian history. The major breaking news from a century ago spreads through the fictional Russian Telegraph. #RetweetTheRevolution – the project’s slogan – speaks for itself, calling on the followers of the reenactment to actively share and engage with the content published. It essentially gives a unique opportunity and experience of interacting with historical figures as if using a digital time machine. For RT, the #1917LIVE project is also a chance to give something back to the audience. After the soft launch, The Russian Telegraph has already garnered quite a lot of support, with nearly 4,000 followers. Other accounts are also getting their fair share of fans. The project will be running at full steam in February, so do not hesitate to relive and #RetweetTheRevolution.